BAND ON THE RUN A punk band finds itself in a tight spot on enemy turf in Saulnier’s borderline-horror thriller. Just how many rounds does that gun have left? What spoken command will make the attack dog attack? How long do you have to choke a very large bouncer before he passes out? Modern action films don't generally address these kinds of nuts-and-bolts questions, because they take place in a heightened reality where events rarely respect the laws of physics, let alone the facts of what violence does to human bodies. Cartoonish mayhem has become so routine on screen that there's something a little fascinating about a violent film that does seem to take place in our world, more or less. Writer-director Jeremy Saulnier's Green Room is such a film. Its plot embodies one of the oldest horror-movie tropes: Outsiders venture into a remote, insular community and pay the price. In this case, the outsiders are a punk band called the Ain't Rights (Anton Yelchin, Joe Cole, Alia Shawkat and Callum Turner) who are trying to scrape up enough cash to get home from an unfruitful tour. When they're offered a gig in a rural Oregon stronghold of neo-Nazi skinheads, they're desperate enough to take it. After the show, one of the Ain't Rights has the bad luck to stumble on the aftermath of a murder. The club's green room becomes their prison, then their fortress, as they fight for their lives against a club owner who is grimly determined to keep his own little collective of "true believers" intact. 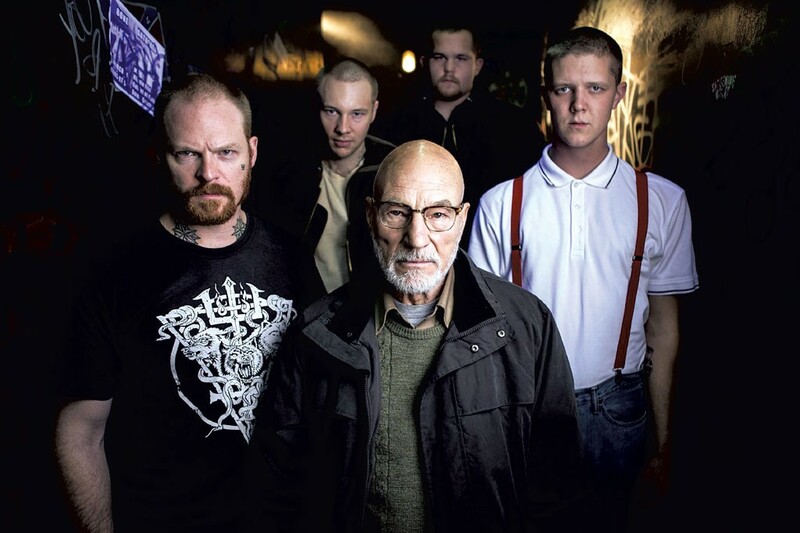 Casting Patrick Stewart — better known as Star Trek's Captain Jean-Luc Picard — as the paterfamilias of the skinheads was one stroke of brilliance. Another was depicting the antagonists as bad people who calmly and matter-of-factly pursue their goals, rather than as drooling backwoods psychos. When Stewart delivers his instructions to his flunkies with the demeanor of thoughtful gravitas that we're accustomed to seeing and trusting in him, the results are all the more horrifying. Saulnier's breakthrough indie film, Blue Ruin, was a chilling portrait of a vagrant seeking revenge with more enthusiasm than competence. Character development isn't his strong suit as a writer, and viewers seeking a hero or a journey in Green Room will be disappointed. At most, it has survivors, and their survival is partly a function of luck. Still, these aren't the paper-thin characters of a slasher flick; the believable dialogue and acting ensure that we cheer when the band members try a winning tactic and gasp when someone meets a gruesome end. And there are several of the latter. Green Room isn't a film for people who dislike violent films. But it is a film for people who like violent films enough to wish they could be a little smarter — just so we could see what happens when our tolerance for nastiness is pushed to the limit. The setting is claustrophobia inducing, the shooting artful, and the tension unremitting. The deaths are all the more painful because no one gets a sentimental send-off — the survivors are too busy surviving. And yet, for all the blood spilled, the most powerful shot in Green Room is one where Saulnier surprises us by defusing rather than escalating the conflict. In this non-programmatic genre flick, any one of the mundane concerns mentioned earlier — the condition of a gun, a dog, an evil lackey — has the power to reverse the course of events. It's the rare attention to all those wildcard factors, and to the frictional drag of reality, that makes Green Room so oddly satisfying. Green Room is not showing in any theaters in the area.